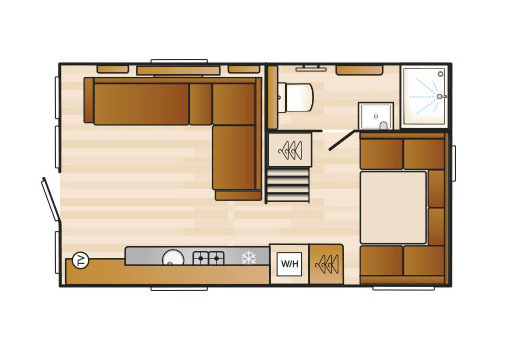 Swift builds on the success of its S Pod 4 with a new six berth version complete with upstairs bedroom no less! Who could have thought it? Swift Caravans as it was once known would in late 2004 go into holiday caravan production. With the help of ex-ABI and Coachman Caravans co-founder George Kemp, Swift entered an already well-served market with mainly Hull-based manufacturers. 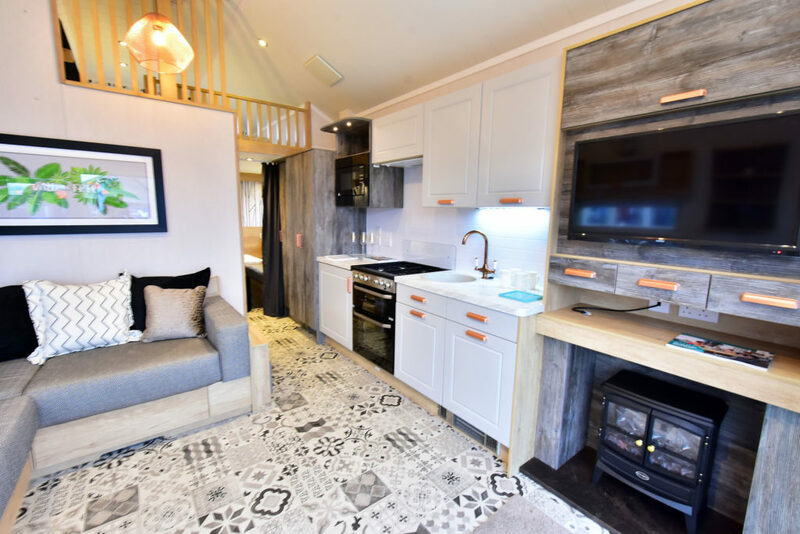 Come right up to 2019 and Swift are producing some really nice lodges and holiday caravans. 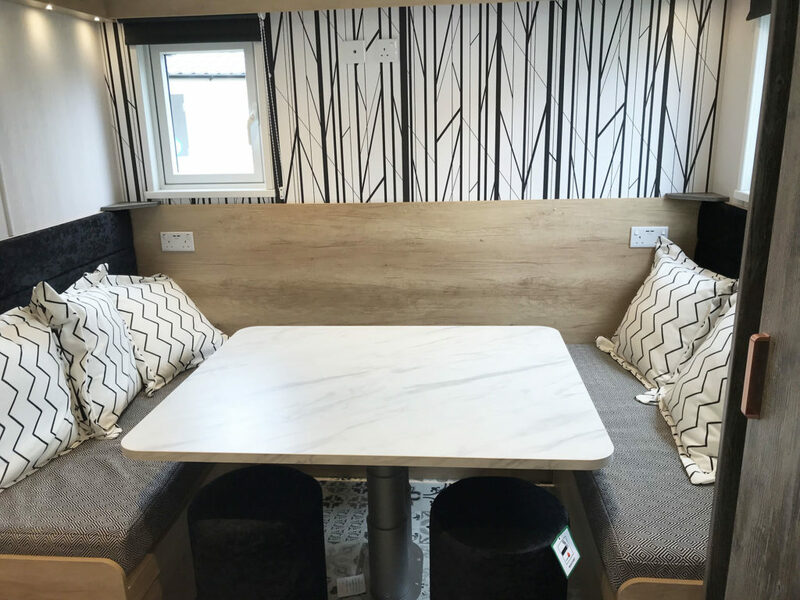 A few years ago the introduction of the S Pod 4, a short compact static caravan, which expanded this section of the market for Swift it’s no surprise that the S Pod 6 should be launched for 2019. 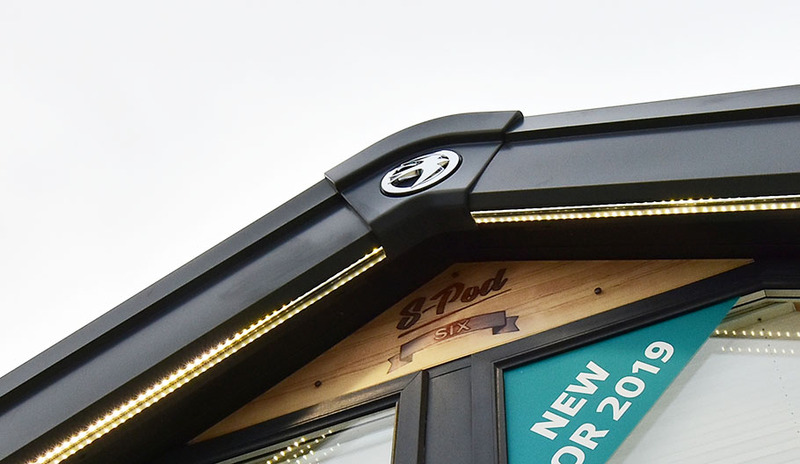 The S Pod 6 has a large hut-like exterior design with an Apex roof and a glass fronted area with single door. Coated steel pantile roof and fully galvanised chassis with 10 year warranty is all part of the spec. Exterior cladding is in Canexcel wood effect while the sides are bonded construction, with downpipes and guttering, plus LED lighting in the front apex roof frame. Step inside through the one and only main entrance and you walk straight into the lounge area. 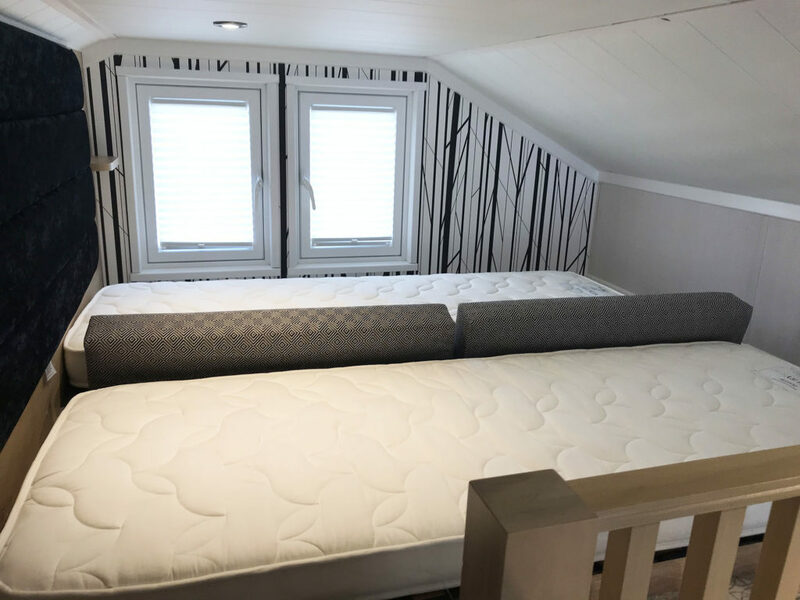 It’s equipped with an L-shaped settee that also forms a double bed and it’s comfy too. There’s shelving above for small bits and a vaulted ceiling creates a spacious feel, while a narrow window is fitted above the settee. There’s an electric stove-effect fire, with fireplace, which has space for a TV. There’s storage here too so the lounge is pretty spacious. 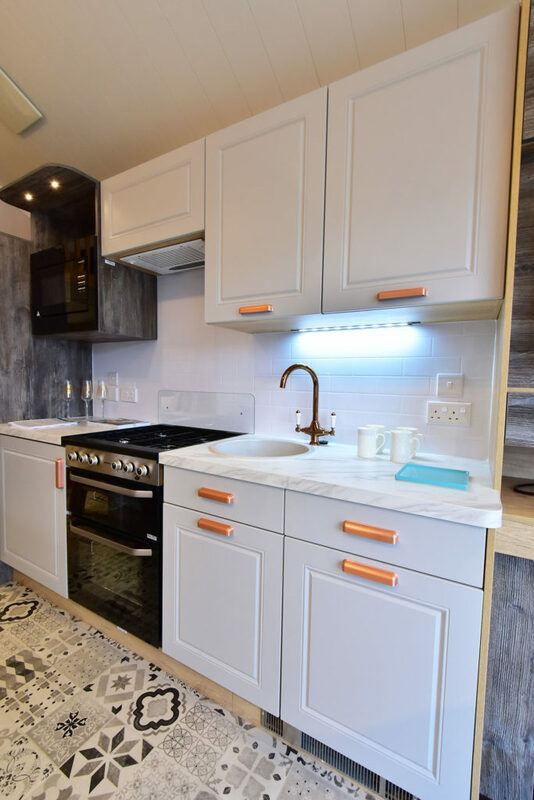 The kitchen is on the right and comes with a good worktop and a two burner hob (oven extra). Just above, to the right, there’s a built in microwave. Cupboard storage is first class and twin mains sockets are fitted plus LED lighting. 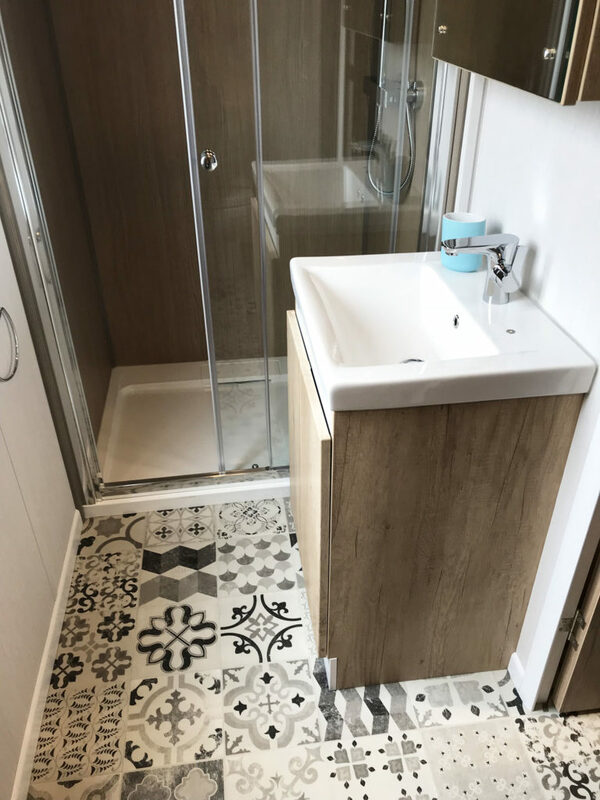 The flooring is bang on trend in a patterned tile effect and the cupboard doors are finished off in a white – all very modern – but we reckon it could be hard work keeping it clean. Behind the kitchen is another seating and dining area with a couple of windows to let in plenty of light. Bench seating here converts into another bed and there’s another TV point here on the back wall. It’s a great little area for eating, socialising or for the kids to colour and play. There’s also a wardrobe under the stairs. 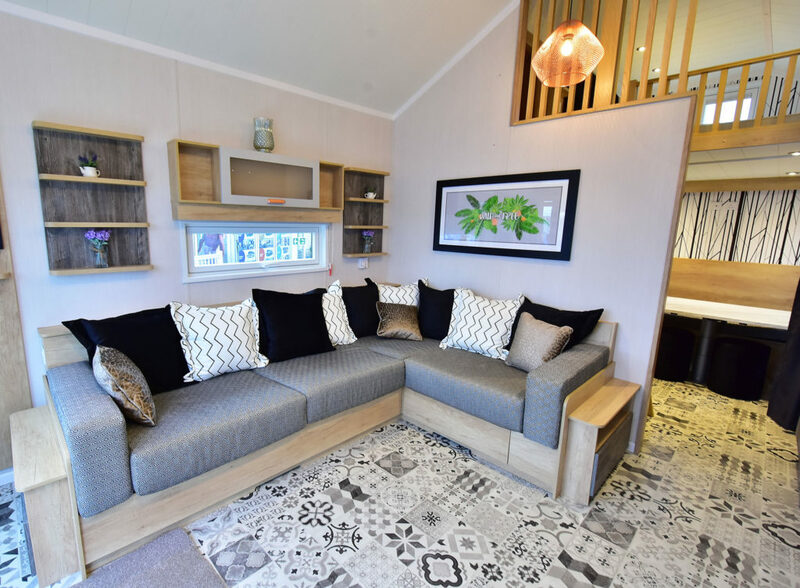 From here you can reach the washroom, which consists of a shower and loo, plus large hand basin – it’s in a sizable area so allowing as a changing room too, if needed. There’s more good storage with a wall cupboard and a cupboard beneath the hand basin. That trendy flooring continues into this area too. Climb the small ladder stairs and you’re in the upstairs bedroom which has a loft apartment feel. The double bed is made up of two single mattresses, with padded head board and side windows sit under the sloping eaves of the S Pod. LED lighting is again well up to scratch and mains sockets are well placed. It’s all cleverly planned and it looks like this is a great addition to the S Pod line up. Verdict: The S Pod 6 is clever in its design. Rather than selling to private individuals as a smaller alternative to a static caravan, it’s more likely these S Pods will be bought by holiday parks to hire out. 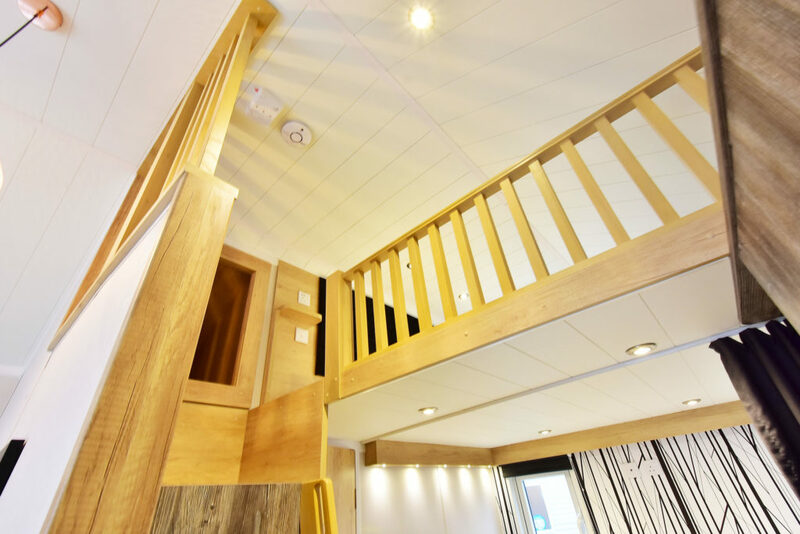 Still we think it’s a great way to show how static caravan design could evolve through effective use of space. We’d like to have seen a full cooker as standard plus a rug in the lounge area. Plus points: Plenty of cupboard and worktop storage in kitchen area, generally good living space, plus large wardrobe. Minus points: No rug in lounge area, no full oven as standard, could do with larger end window in the dining area. In a nutshell: Great to hire out, ideal for young families. UK maker dares to be different and we like it! If you’re looking to buy this S Pod why not get a great deal insurance quote from us today; click here to get your quote online. 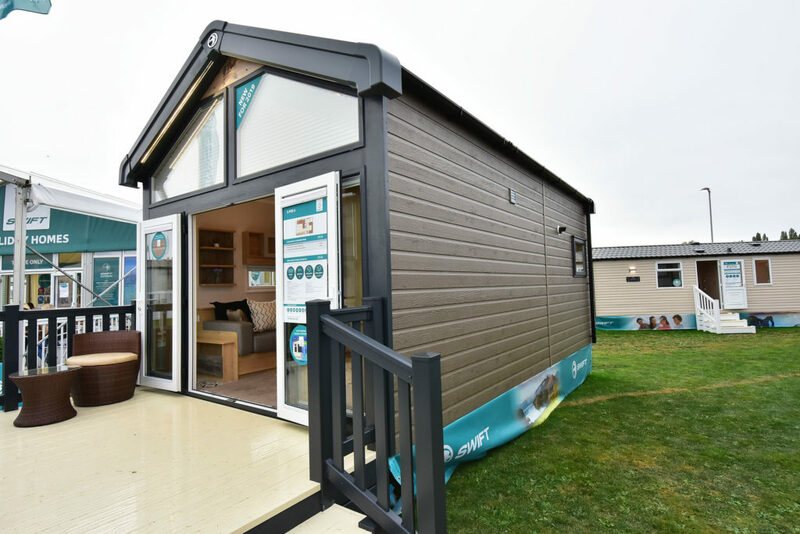 For more information about Swift’s holiday caravan range visit www.swiftgroup.co.uk, email enquiries@swiftleisure.co.uk or call 01482 847332. *Extra charges will be made by park operators and/or distributors for transport and siting and annual maintenance. Please check the price carefully before you commit to buy as prices vary considerably dependant amongst other factors, on the geographical location of your chosen park.